Our goal is to help you lead a happier, healthier life. By using our interactive book, A Completely Balanced Life, you can make the concept of life balance much more concrete and something you can act upon every day. We want to give you the tools to achieve and maintain a healthy, balanced life. It’s time to put your house in order and start living your best life. Just like the foundation of a house, you need a strong base to achieve overall health and well-being. This foundation is called The Basics. 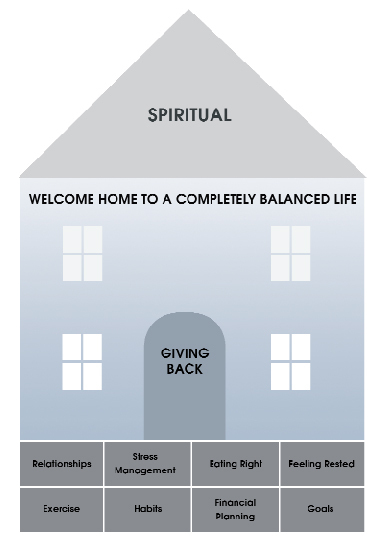 Learn more about the different roles the 8 Basics, as well as Giving Back and Spiritual play in your life and how they contribute to your overall life balance. To find your balance, order your copy of A Completely Balanced Life. Add the Personal Use Book, a companion workbook, to your order to help you track your progress.